Amino acids linked together during a condensation reaction to form a peptide. Protein synthesis is the process during which the chemical instructions on genes are used by a living cell to make proteins. It is a highly complex procedure that involves a great number of chemical reactions, both inside and outside the nucleus, which are catalyzed by a host of enzymes and cofactors. Codons are the instructional codes used by cells to identify which amino acids are to be used to assemble proteins. They are three nucleotides in length, and are read by the cell as its machinery moves down the strand of the gene. Some example codons are listed in the following table along with the amino acid they represent. Nucleotide codons and their corresponding amino acids. Codons are not only found on genes (DNA) and the mRNA transcript, but also on an RNA molecule called the transfer RNA (tRNA), which brings amino acids to the site of protein synthesis (ribosome). The tRNA also carries both an amino acid and a codon that is compared with the sequence on the mRNA, and if they are complementary to each other, the amino acid is incorporated into the growing protein chain by the Ribosome. As mentioned above, the mRNA is a copy of a gene that serves as the template for protein synthesis. The cells protein-synthesizing machinery (ribosomes) translate the mRNA codons into a string of amino acids that will eventually constitute the protein molecule. Codons also provide information that instruct the cell where to start and stop translation. Messenger RNA (mRNA) is a single-stranded RNA molecule that is complementary to one of the DNA strands of a gene. The mRNA is an RNA version of the gene that leaves the cell nucleus and moves to the cytoplasm where proteins are made. During protein synthesis, an organelle called a ribosome moves along the mRNA, reads its base sequence, and uses the genetic code to translate each three-base triplet, or codon, into its corresponding amino acid. The cellular machinery responsible for synthesizing proteins is the ribosome. The ribosome consists of structural RNA and about 80 different proteins. In its inactive state, it exists as two subunits: a large subunit and a small subunit. When the small subunit encounters an mRNA, the process of translating an mRNA to a protein begins. In the large subunit, there are two sites for amino acids to bind and thus be close enough to each other to form a bond. The "A site" accepts a new transfer RNA, or tRNA—the adaptor molecule that acts as a translator between mRNA and protein—bearing an amino acid. The "P site" binds the tRNA that becomes attached to the growing chain. The adaptor molecule that acts as a translator between mRNA and protein is a specific RNA molecule, the tRNA. Each tRNA has a specific acceptor site that binds a particular triplet of nucleotides, called a codon, and an anti-codon site that binds a sequence of three unpaired nucleotides, the anti-codon, which can then bind to the the codon. Each tRNA also has a specific charger protein, called an aminoacyl tRNA synthetase. This protein can only bind to that particular tRNA and attach the correct amino acid to the acceptor site. The start signal for translation is the codon ATG, which codes for the amino acid methionine. Not every protein necessarily starts with methionine, however. Oftentimes this first amino acid will be removed in later processing of the protein. A tRNA charged with methionine binds to the translation start signal. The large subunit binds to the mRNA and the small subunit, and so begins elongation, the formation of the polypeptide chain. After the first charged tRNA appears in the A site, the ribosome shifts so that the tRNA is now in the P site. New charged tRNAs, corresponding the codons of the mRNA, enter the A site, and a bond is formed between the two amino acids. The first tRNA is now released, and the ribosome shifts again so that a tRNA carrying two amino acids is now in the P site. A new charged tRNA then binds to the A site. This process continues until the ribosome reaches what is called a stop codon, a triplet of nucleotides that signals the termination of translation. When the ribosome reaches a stop codon, no aminoacyl tRNA binds to the empty A site. This is the ribosome signal to break apart into its large and small subunits, releasing the new protein and the mRNA. The translation of the mRNA into a chain of amino acids is not the end of the process. 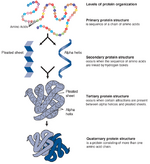 A protein will often undergo further modification, called post-translational modification. For example, it might be cleaved by a protein-cutting enzyme, called a protease, at a specific place or have a few of its amino acids altered. The product of a single gene is a string of amino acids called a peptide or polypeptide. This is known as the primary structure of a protein. The peptide is then folded to form a particular subunit, and then joined together with other peptides to make a functional protein. Protein structures are known by 4 levels of organization: primary, secondary, tertiary, and quaternary protein structures. 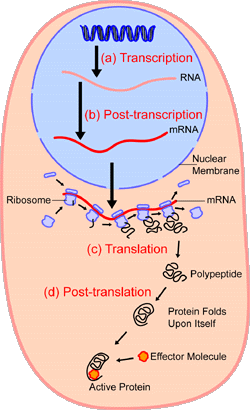 Diagram of transcription and translation during gene expression. ↑ Primer on Molecular Genetics: Introduction by the U.S. Department of Energy, Accessed January 22, 2011. ↑ Messenger RNA (mRNA) Talking Glossary of Genetics Terms, National Human Genome Research Institute. Accessed September 25, 2010. ↑ 3.0 3.1 3.2 3.3 What is a Cell? by the National Center for Biotechnology Information. ↑ Protein and Polypeptide Structure: Four Conformation Levels of Protein Structure By Anne Marie Helmenstine, Ph.D., About.com Guide, Accessed January 22, 2011. This page was last modified on 27 July 2014, at 17:22.